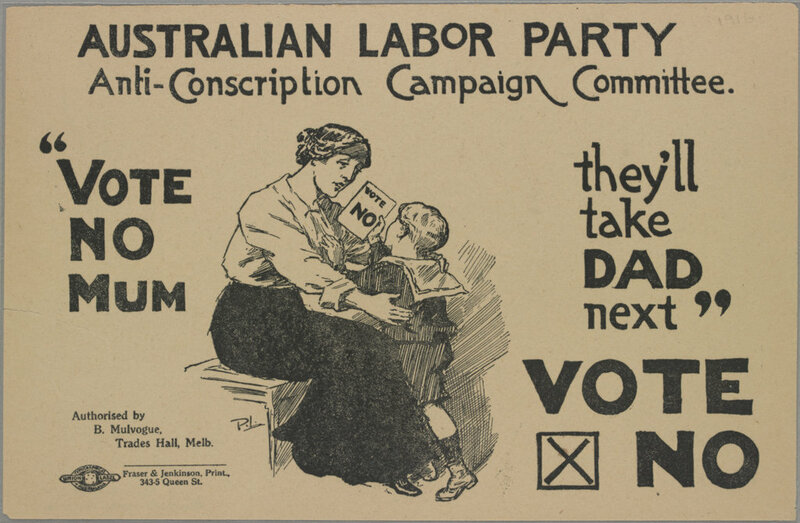 On 28 October 1916 the first of two controversial conscription referendums was held in Australia. Military training for men between 18 and 60 had been compulsory since 1911, but the referendums asked to extend this to overseas service. If Australians voted ‘yes’ for conscription, many of their mates would be forced to go to war. The referendums kicked off bitter debate about the merits and dangers of conscription. 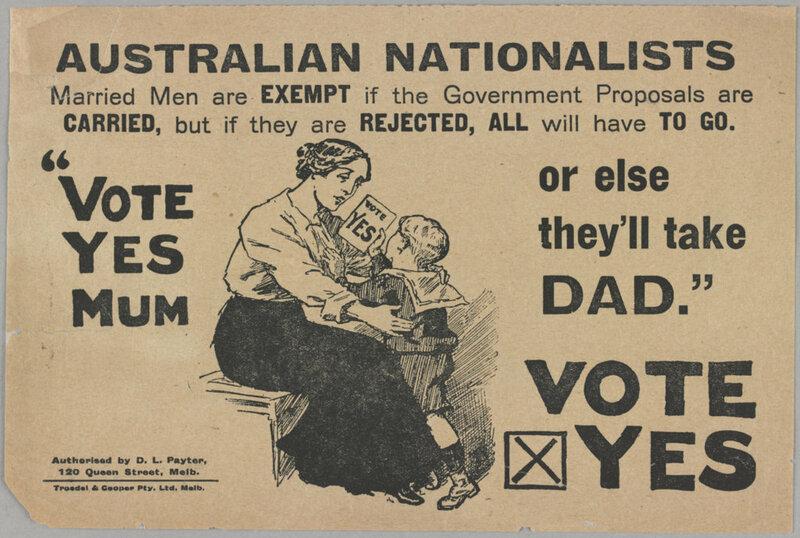 Pro and anti conscription propaganda played on sectarian and anti-Irish sentiments, fears of immigration, and gender stereotypes, highlighting all sorts of tensions, fears and prejudices within Australian society. The issue was so divisive it led to a split in the Labor Party. Both referendums were unsuccessful. The first referendum was defeated with 1,087,557 votes in favour and 1,160,033 against. The second (held on 20 December 1917) was more comprehensively defeated, with 1,015,159 votes in favour and 1,181,747 against. You can discover digitized conscription pamphlets and posters from our Riley and Ephemera Collection by searching our catalogue using the words Riley conscription World War 1914-1918. If you just want to see items that are available online, select the option ‘online resources’ near the top of the search results page. Our favourite examples, highlighting the arguments used by each side, are the Vote no Mum and Vote yes Mum pamphlets. At first glance they appear to be the same, but closer observation shows that they present opposing views, using the same image and a slight change in slogan! how many times would they of had to draw those posters out. what if you made a mistake. These posters would actually have been created as prints, most likely lithographs. For example, the poster ‘Vote yes mum’ was printed by Troedel & Cooper Pty. Ltd., who were well known Melbourne lithographers. You can read more about how the lithography process works on Wikipedia. i don’t know Brenda but i would hate to see. This is magic stuff from the First World War. The federal government at the time was faced with our huge losses of 1915 and 1916, primarily on the Western Front, and saw conscription as an answer to this. 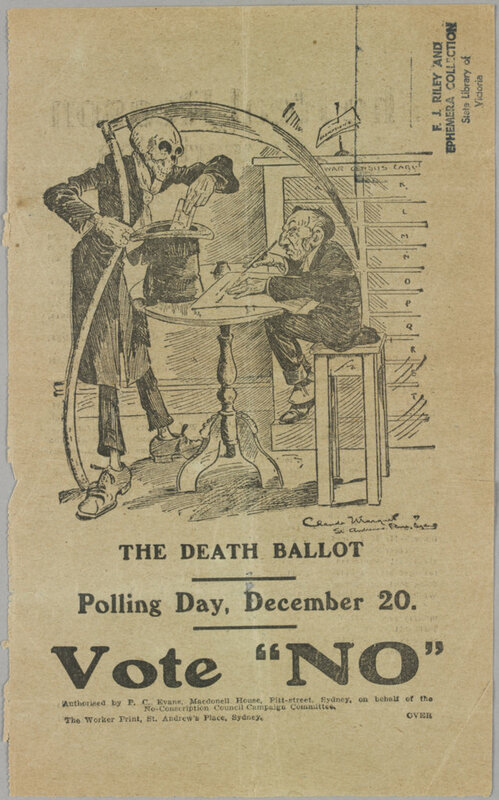 Despite a massive campaign, neither of the two conscription referenda were successful, I believe due to Australians’ basic antipathy to being forced to do something against their will. It is interesting to note that a referendum is only legally required to alter the federal constitution, so the government in 1916 could have simply passed the conscription legislation as was done for the Vietnam War.